Vasundhara retired as secretary general of Mumbai-based Media Research Users Council. She and her husband Srinivas live in Dubai. They have two sons. Mohammad Akmal is a professor of medicine at the USC Keck School of Medicine and has directed its dialysis program for more than twenty-five years. 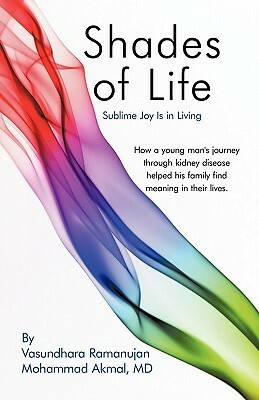 This book, a non-fiction, is the recollections of the journey taken by a family after one of them was diagnosed with kidney disease. To have a feeling that that might be the problem and then hearing it is one thing, but going to the doctor for a persistent headache and finding out that the matter is something completely different is another. The settled family rises up to help the son, Aditya, fight against the odds. The author Vasundhara, the mother donates her own kidney to him while fighting a disease herself. And their efforts are fruitful as Aditya survives and goes on to get his PhD. For me, the afterword by Srinivas Raghavan was quite touching. He tells us acceptance is a big part in fighting any disease. Consistent negligence is a cause for harsh steps, but though we may not be able to forget the slightest mistake when it comes to our loved ones, we also have to accept that even doctors are human beings. It is God’s will as well what may or may not happen. I rate this 4/5, and feel that it is a book worth reading. Also shared with: First Reads and IQRC.